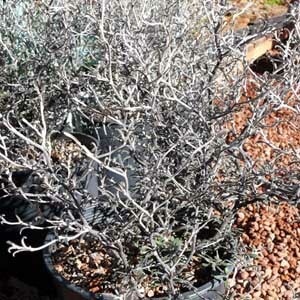 One of the most unusual plants growing in my garden is the gnarled, twisted little shrub Corokia cotoneaster–what I like to refer to as “The Nightmare Before Christmas Tree.” Grey leaves growing upon black, zig-zagged stems may lead the untrained eye to think that this member of the Dogwood family is already dead. Prune it back to showcase its twisted form and add a little up lighting and you can get a spooky effect worthy of the most haunted of houses! Macabre beauty aside, Corokia often appears in groomed commercial landscaping with golden cypress and crimson Japanese maples because of its contrasting color and interesting shape. ‘Little Prince’ is my personal favorite variety because its stems seem to be particularly black, and it grows much slower than the other varieties (it is a dwarf) and therefore lends itself very nicely to container gardening. Hardy to most climates, I’ve seen it in the dead of winter reaching out from a snowy bed like a skeletal finger. Hardy to 20 degrees and I’ve seen it in the dead of winter reaching out from a snowy bed like a skeletal finger! Full sun in milder climates, plant it in a shadier spot if you live somewhere that gets extra hot. Can survive pretty well in either!